Rather than sticking with his usual essay format, David Sedaris takes a different route in Squirrel Seeks Chipmunk and converts his essays into modern Aesop's fables, using animals to describe the awkward often painfully so) situations that humans get themselves into. Each essay is only a few pages long and often end in a pretty dark way. I think this is Sedaris's most critically panned book. For some reason it just doesn't have the humanity that his essays about his own life often have. While the situations the animals in the book get themselves into are recognizable, and the idea of putting animals in human situations is certainly unique, something about the stories just falls flat. I got the point Sedaris was making in each story, but I didn't relate to the essays. While he typically makes even the most obnoxious characters somewhat sympathetic, that didn't translate to his animal characters. 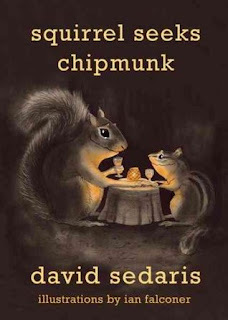 Even though this wasn't my favorite book by Sedaris, I didn't dislike it as much as many people seemed to. Because I could recognize the humanity in the animal essays, I was kept interested and even got a few chuckles in. I don't regret the time I spent reading it, but I can't say I really laughed out loud at any points. If you are, like me, determined to read all of Sedaris' back catalog, then you'll need to read this one too. And it's not an unpleasant read. But if you're just looking for a funny book, I'd go with any of his others over this one. It's not a necessary read and I haven't seen many other great reviews of it. I haven't read any of Sedaris' books. The premise sounds interesting, using Aesops fables, but I guess I.sh ould start with something else.